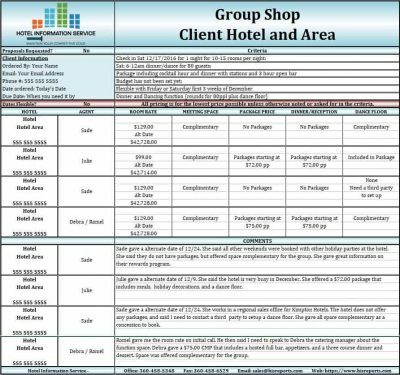 A group shop from Hotel Information Service will provide you with pertinent information as to how your competitor hotels handle group requests. You may set the criteria to your own specifications. We shop AV pricing, F & B minimums, room rates, meeting space rental, and anything else you may want to know. We also provide a comment section were details of the conversations with sales agents can be detailed. Calling is always the key function of our shopping. The cost of this report is based on up to 5 of your competitor hotels. Our office receives a Group Shop Request Form filled out by the client including what type of group we are shopping for i.e. Corporate, Association, Government, Reunion; the Number of rooms needed; Dates being shopped for; the Number of people attending; audiovisual needs; Food and Beverage needs; and any additional details they need to know such as attrition, cancellation policy, etc. – you name it, we’ll get you the information. The request form then gets processed and is sent out to the Group Shop Team. (This team focuses specifically on Group Shops, so they are very good at getting what you need.) Immediately they begin calling the hotels noted. There is a lot of correspondence that goes on between our agent and the hotel’s sales department contact. We have emails and e-voice for any needed call backs. Our agents try to get most of the information on the first call; they also request written proposals for back up. All of the obtained information gets sent back to the office, and our data entry staff gets the report ready to send off to the client via email. Turnaround time is usually 7 – 14 business days (International Shops approximately 14 business days); however it can take longer if we run in to a difficult sales agent.